Modi inside Mosque, and people chanting in zest… MODI!…MODI!! Indian Prime minister, Narendra Modi,after 34 years visited the strategic importance country in gulf. Zaid-Al- Nahyan, Prince of Abu Dhabi, departing from the protocol went ahead for the receiving of the Indian Prime Minster at airport. His 5 brothers with the prince were present there to welcome Mr. Modi. Prime minister extended his gratitude and appreciated them. Prime Minister arrived on Sunday at 4.30 afternoons for two days visit in UAE. During the visit the PM will hold talks to discuss with top leaders on trade and security like principal issues, and will address there the residing Indian. Zafar Saresh Wala, vice chancellor of Maulana Azad National Urdu University Hyderabad with the PM were present there. Saresh Wala is acquainted very close to Modi. Prime Minister made selfie inside Mosque with many one. 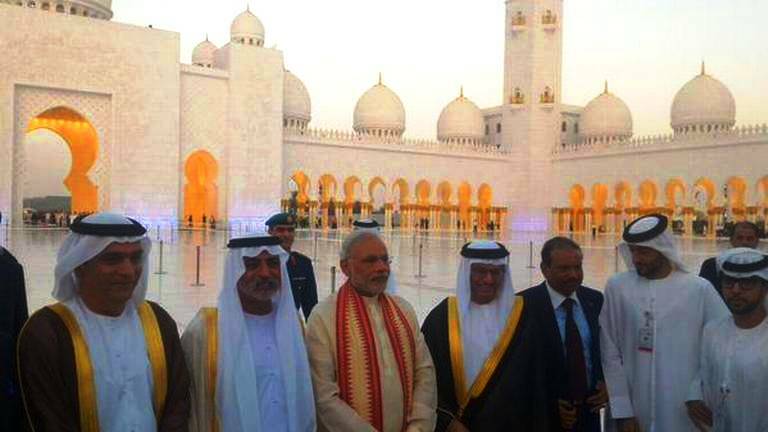 Prime Minister arrived on Sunday at Abu Dhabi and visited to the grand mosque, Shekh Zaid, in the world. It was his first visit of a mosque. There were crowds of thousand to look Modi inside the Mosque, and the people were chanting in zest… MODI…MODI.